Two years ago, we went to the 2014 N.A.S.H. (National Alliance of Secular Homeschoolers) convention in Atlanta, GA. Since then there really hasn’t been a good opportunity for us to attend a secular homeschool convention within a reasonable distance to us. But this year we are happy to announce two conventions we will be attending this year in March and June (so far)! 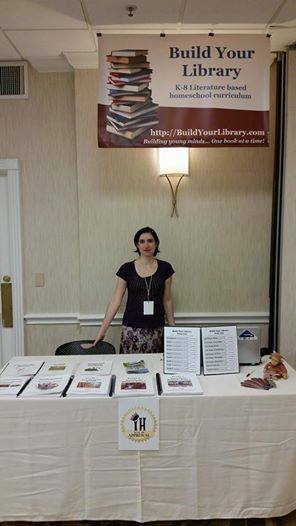 Build Your Library will be at the 2017 VaHomeschoolers Conference and Resource Fair on Friday, March 24, and Saturday, March 25, 2017 at The Cultural Arts Center at Glen Allen, Virginia. Their annual two-day conference usually yields over 1,000 homeschoolers from all around Virginia and the surrounding areas. Attendees will enjoy dozens of sessions featuring speakers (Keynote: Julie Bogart) and topics ranging from a wide variety of homeschool philosophies and approaches, as well as an exhibit hall (with a Build Your Library booth), used homeschool resource sale and several social events. A few months later, the S.E.A. (Secular. Eclectic. Academic.) 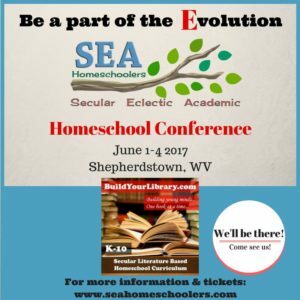 Homeschoolers will be hosting their inaugural SEA Homeschoolers Conference 2017 on Thursday, June 1 through Sunday, June 4, 2017 at Shepherd University, in Shepherdstown, West Virginia. They have a full 4-day schedule of events, over a dozen speakers (Keynote: Blair Lee) and a bunch of secular homeschool related vendors. Besides hosting a Build Your Library vendor booth, I am also one of the featured speakers, giving a talk on Living Books and Adapting Charlotte Mason for Modern Secular Homeschooling on Saturday, June 3rd at 4PM. 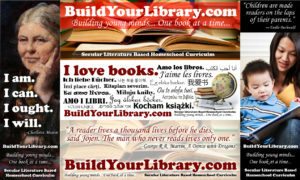 Build Your Library will also be participating in S.E.A.’s National School Choice Week podcast, being recorded early January. They will be covering things like how to get started with homeschooling and various homeschool methodologies with speakers Meg Grooms, Blair Lee, Emily Cook, Kate Laird, and Jason Grooms. You can get more information on these talks and the speakers giving them on the SEA Homeschoolers’ website. I will post the link to my podcast when it is released during the 4th week of January. If any of you are anywhere near or within travel distance to either of these conferences in West Virginia or Virginia, we would love to see you in person at our Build Your Library vendor booth. If you have been looking for one of the few-and-far-between secular homeschool conventions, the SEA Homeschoolers Conference 2017 may be the one you want to make plans to get to. Both of these events have close and affordable lodging options for those traveling from out of town and are both packed with activities and talks to keep you busy. 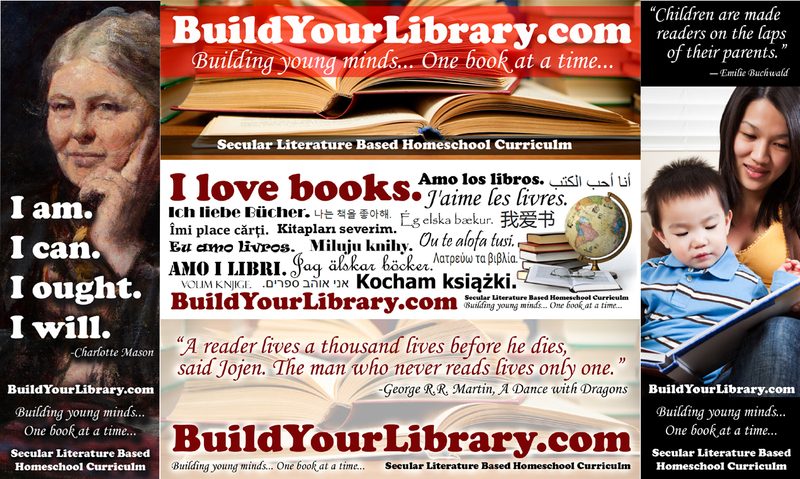 Please swing by one of our booths and say hello, grab some Build Your Library swag (we just ordered a ton of new BYL bookmarks, pencils, and catalog flyers) and talk to us about our homeschool products in person. See you there! That’s great! I wish we hadn’t moved from VA last summer. Now we’re eyeball deep in the bible belt in Mobile Alabama. Hopefully we can get get a secular conference down here in the future.